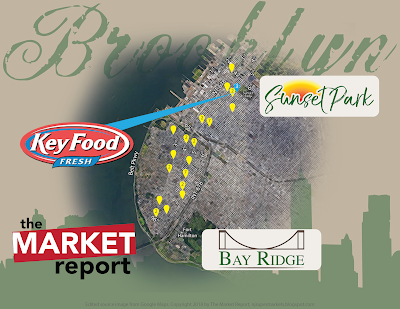 Next stop here in Sunset Park: another store tour, and another Key Food affiliate. This one is, shall we say, on a different speed from yesterday's Food Universe. Food Universe is a brand-new, tiny store. 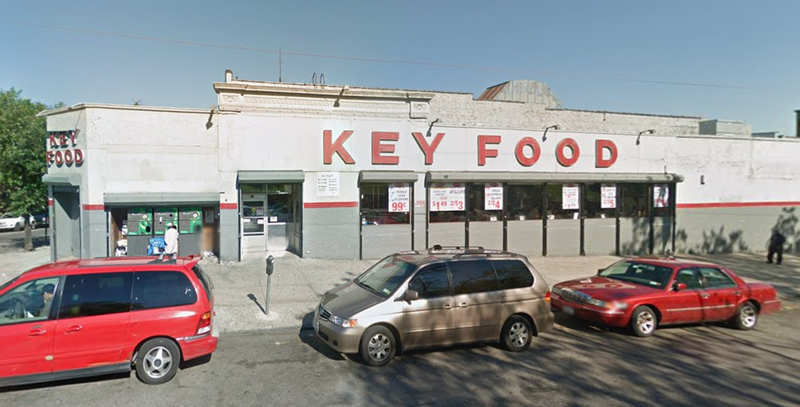 This Key Food is a longtime neighborhood standby that's actually as spacious as any suburban supermarket. The store, owned by Pick Quick Foods, was recently redone outside. Here's a look, courtesy of Google Maps, of the pre-renovation exterior, in 2011. Notice the details above the entrance in the trim. Obviously the building is quite old, and if I had to bet I'd put money on a former theater, as supermarkets have been known to move into old theaters. The high ceiling in the center would also suggest a theater. Notice that the building has been repainted and fixed up with a new awning on the front. Pick Quick is now making more obvious use of the existing trim features on the building than they did in the past. 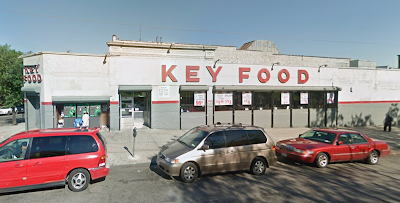 It's worth mentioning that this Key Food is directly across the street from Sunset Park, the park after which the neighborhood is named. 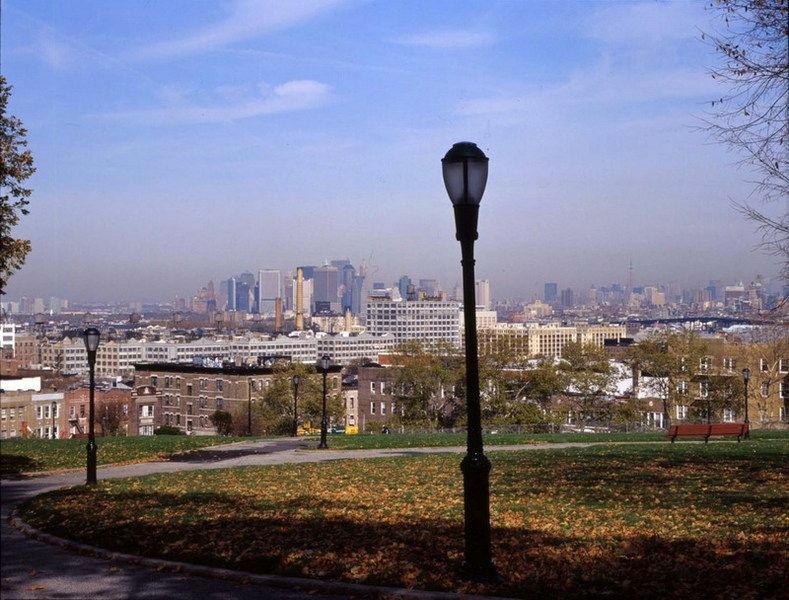 The park is so named because it's up on a hill, meaning that you can see the Manhattan skyline to the west with the sunset behind it. The store's layout is pretty simple. Produce lines the first aisle, with dairy along the back wall and meats in the last aisle. Frozen foods are in the front corner. Despite the store's large size, there are no service departments. The store's produce department is fairly extensive, including some organics. The first aisle has a very low ceiling, while the ceiling gets very high over the aisles. I don't know if the decor was installed like this or if it was repainted at some point, but all the department signs just blend into the background. Interesting choice. The Pick Quick name is pretty prominent in the store. In fact, they take full advantage of the store's high ceilings by having a huge Pick Quick Key Food sign over the first aisle. The dairy graphics are equally large, but less overwhelming because of the (too) neutral colors. We get a little color in the meat department at the far side of the store. The fixtures here are very old, although they look to have been repainted. You'd never know you were in the middle of a busy neighborhood in Brooklyn! The store is more spacious than almost any other supermarket I've come across in any neighborhood of New York City (of course, I haven't been to too many). As usual, though, large paper products are stacked on top of other cases to minimize the shelf space they take up. I'd imagine the decor here has been repainted, since the photos look a little older and a little more faded than the rest of the decor. Plus, the bright-red aisle markers don't exactly match the soothing beige and green walls. Some frozen foods in the second-to-last aisle. Again, look how wide that aisle is! Looking toward the front of the store. The same aisle, looking towards the back of the store. The Sunset Park Key Food tops out at 10 aisles, plus a produce aisle and an alcove in the front for more frozen foods. More readable meats in the last aisle. Ice cream and bread in the front alcove. Once again, we see prominent Pick Quick branding in the alcove. Despite how spacious the store is, this is the manager's office. It might also double as customer service in the front, as I don't remember a separate customer service counter. If you zoom in, you can see that some of the papers hanging here even still have the old Key Food logo printed on them. I do not believe there was a manager in here at the time of this photo; there was a guy in a dress shirt and tie walking around who gave me several questioning looks, but didn't say anything about my photography. Here's a look at the front end from the produce side. Again we see the Pick Quick name along the front end, which is unusual for Key Food operators. A look along the front of the store. One more look at Pick Quick before we head out.